Whatever your feelings about the humble fist bump, be it panic when expecting a handshake or derision at the hipster's favourite way of greeting, it could be the new way to open your front door. Not through a combination of super-strength and an infinite supply of doors, but through what could be the next step in wearable technology, the new trend that's covering everything from fitness to reminding you to buy the milk. A new NFC ring, from inventor John McLear, a slim-line dual sided device that slots neatly on your finger and uses contactless technology that can communicate with other NFC enabled devices to help automate everyday tasks that we hold not so dear. NFC (Near Field Communication) technology has been bubbling away for a few years now, but while included as standard in most phones and tablets, it has limited usability and few have come up with ideas to utilise it as a tool for data transmission. Contactless payments are on the rise thought, and even though most of the card providers don't use NFC, the concept of easy wireless transfer is forcing its way into our everyday lives. So with the landscape begging for something to catalyse it into action, could the NFC ring be the contactless saviour? The new device can unlock phones, pass on digital business cards, give Wi-Fi passwords to friends, start a car, hold your bitcoin address and most interestingly, unlock doors. TechRadar was luckily to get its hands on the NFC ring, so we decided to find out the answers to the obvious questions as soon as you pick up a novel concept such as this. Is it really just a ring? Yes, and as long as you don't mind a bit of bling or people coming up to you asking 'when's the big day' then you should be OK. 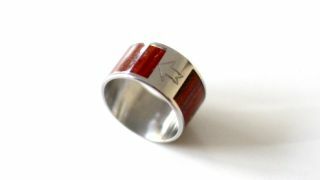 It comes in a number of designs (we've got the oak on metal version) but the standard is a simple, one colour, metal ring. It has two NFC chips inside:the public side, which transmits data that you're happy to share with others – like contact details and website links – and a private side for the more personal stuff, like unlocking your door. The public side is designed to sit on the top of your hand, and the private part on the underside. As with other NFC devices, it's programmable and this can be done simply by holding the ring up to the 'sweetspot' (where the NFC receiver is) on your phone and connecting. All you need to do then is download the app and select how you want to use it. Once you've decided, you'll need to hold it up to the sweet spot again and let it transfer the information to the ring. In the app you can set it to perform a wide range of tasks, with the app coming with some basic suggestions such as adding your Facebook or Twitter addresses or linking to a particular website. But there's so much more potential on offer here, so we decide to explore this a bit further. We set the ring to hold a link to a download of some free virus protection software, and sure enough, when it touched another device, it began the download. The possibilities instantly feel vast, you'll be able to hold Payment information on the ring and pass it on to friends who owe you money, or give people links to videos and live streaming events in a matter of seconds without fluffing about with addresses. Interestingly, to differentiate between private and public functions, you'll need to use different gestures – a clever way to programme yourself into not making a potentially costly or embarrassing mistake.